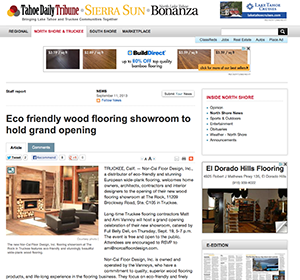 Nor Cal Floor Design article about best flooring contractor | Nor-Cal Floor Design, Inc.
Nor-Cal Floor Design’s Grand Opening celebration made it into the Sierra Sun, our local daily newspaper. The great article includes information about what our brand new showroom offers, our background, and our grand opening event on September 19th. Take a minute to learn a little more about our opening and check out the article.